I bet everybody knows who Einstein is, and many people know why he is famous and how he left is mark in the scientific world. Still, aside from his brilliant results in physics (mostly), he is also very well known for his aphorisms, metaphors and overall interesting way of expressing himself. 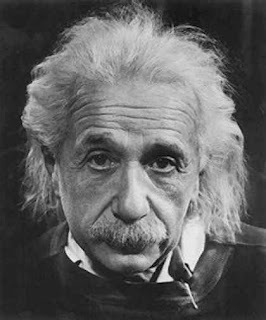 I’ve always found it hard to understand why “believers” claim that Einstein is “one of them”, relying on one of his famous aphorisms: “Science without religion is lame, religion without science is blind.”. Seems quite a jump to me, but there are even further indications that he had really no true interest in religion, especially a little known letter that he wrote on January 3 1954 to the philosopher Eric Gutkind who had sent him a copy of his book Choose Life: The Biblical Call to Revolt. Due to be auctioned this week in London after being in a private collection for more than 50 years, the document leaves no doubt that the theoretical physicist was no supporter of religious beliefs, which he regarded as “childish superstitions”. It is well known that Einstein was born in a jewish family and he made remarks about this on several occasions, but despite this, his feelings towards religion are of disbelief, to say the least, and rejected the idea that jews are god’s favorite people. The letter will go on sale at Bloomsbury Auctions in Mayfair on Thursday and is expected to fetch up to £8,000. Also, probably the most famous of his quotes is somewhat religious: “He [God] does not throw dice” when referring to randomness thrown up by quantum theory. Still, this is a metaphor to say the most, but unfortunately his position was widely misinterpreted. Despite his categorical rejection of conventional religion, Einstein discharged the fact that his ideas were used by evangelists for atheism. He was offended by their lack of humility and once wrote. “The eternal mystery of the world is its comprehensibility.”. 16.000$ for a letter… the chance to shove it in the face of creationists all over the world… priceless !